Comments: With their white head and tail, dark body and 7-foot wingspan the bald eagle is one of our most recognizable birds. In 1782, the bald eagle was adopted as our national symbol. In the 1970s, the population dropped to approximately 2,000 birds in the lower 48 states. They were listed as an “endangered species” in 1973. With the banning of the chemical DDT the birds have made a slow but steady recovery. The bald eagle was removed from the federal list of threatened and endangered species on August 8, 2007. It was removed from the state Threatened list in 2009. Young eagles less than 4 years of age do not have the white head and tail and are sometimes misidentified as golden eagles. Distribution: The bald eagle is found only in North America. Most of its population nests in Alaska and Canada. Through the winter, migrants are found around most of the large reservoirs and rivers in Kansas. A growing number of bald eagles have nested in Kansas since 1989. 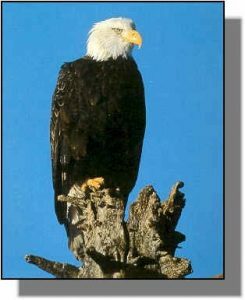 Food: Dead or dying fish and waterfowl make up most of the diet for bald eagles. They will also feed on dead deer or livestock when available.